When you score Posted Bounty, you may forfeit it to give the Runner 1 tag and take 1 bad publicity. "If some two-cred newsy picks it up, even better. The scum could be in the alleys of Guayaquil of the slums of BosWash. Not to mention off-planet." 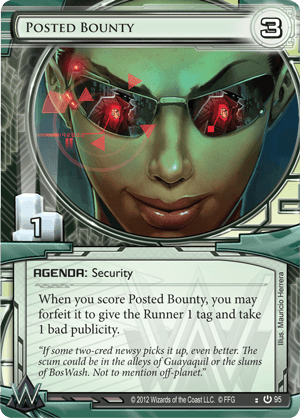 While Posted Bounty received some use early on as a way to tag the runner for the Bagging that would come shortly after, it unfortunately suffers from a lot of problems to make it a worthwhile card. First off, as a three for one, it must be advanced over two turns to score it. While that could mean a score, Scorched Earth Scorched Earth combo on the second turn, it also requires a scoring window. Then because the corp must wait for a window, it sits in HQ where it can easily be stolen, messing up the plan. Second, it must be forfeited immediately when scored, so if the rest of the kill combo is not in hand, then it is a hefty price - not only a lost potential agenda point, but a Bad pub that will make scoring future agendas harder. That being said, the right playstyle around it can work - If say a SEA Source was in hand with the two Scorched, it could be used as bait. The runner heads down a taxing remote, and steals the agenda that was IAA’d. Then they are too low on credits to stop the SEA Source. Or if they don’t run down, advance, score, scorch scorch. That is a four card combo however, which makes it tricky. Posted Bounty has too many problems to make its upsides (The chance of a dead if you do, dead if you don’t scenario) worthwhile. ...or splash 24/7 News Cycle, score early, fire when required, paying with some Hostile Takeovers. This should work as well.